Press raising funds for The Compass, a program of Michigan Community Services Inc. aiding adults with developmental disabilities. Diener is no stranger to large-scale charity projects, after putting together the Not Safe To Drink music compilation which helped raise over $9,000 for the Flint Child Health & Development Fund. HOPE hopes to follow in the footsteps, creating buzz with a tangible item to not only raise funds for a good cause but bring attention back to a forgotten city. 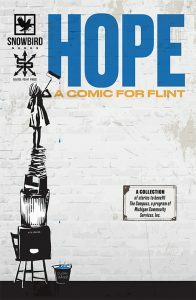 The creative team behind HOPE plays a large role in the unique anthology they’ve created. Writers Jonathan Diener, El Whitcombe, Sam Moore, Robb Anthony and Carl Mizell were paired up with artists Emily Woodruff, Kadee Spangler, Craig Horky, Michelle Lukezic and Miranda Ireland to bring each story to life. The eclectic array of creators includes freelance music writers, a playwright, graphic designers, a tattoo artist and a comic shop manager. HOPE: A Comic For Flint will be released on September 1st at a release party and concert in Flint, Michigan at Foster Coffee Company. 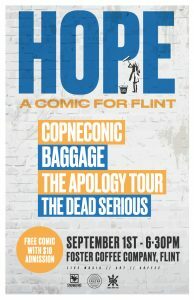 The bands performing (Copneconic, Baggage, The Apology Tour and The Dead Serious) all feature one creator of the comic. Doors at 6:30. All Ages. $10 admission gets you a copy of the comic.